Four months after a shooting death brought an end to its encampment in City Hall Park, Occupy Burlington is striving to reassert its relevance and regain its momentum, starting with a March 30 protest coinciding with President Obama’s fundraising stopover in Vermont. The local movement might eventually attempt a reoccupation of a public space, organizers say. “That’s a question being discussed as a strategic option, with a variety of opinions being expressed,” says Thomas Grace, a regular at Occupy Burlington’s general assemblies. One possibility, adds activist FaRied Munarsyah, is a series of “pop-up occupations” that could occur for a night or two at locations around the state. Might that include Burlington itself? The answer could depend on how relations develop with Mayor-elect Miro Weinberger, whom many occupiers regard with skepticism. While it didn’t go into full hibernation, Occupy Burlington hit the snooze button after the park eviction and the onset of winter. Marching slowed and organizers moved the weekly public meetings indoors. Concerns about Occupy’s diminished public presence were voiced — passionately at times — at a March 18 general assembly held in the basement of the Unitarian Universalist church. About 25 participants seated on metal folding chairs debated for about half of the two-hour meeting on whether to move the assembly to City Hall Park on a sunny, 70-degree Sunday afternoon. Six younger occupiers eventually stormed out of the assembly in frustration and anger at the group’s inability to reach consensus in favor of the outdoors option. The protracted haggling highlighted the unique character of a leaderless movement that requires virtual unanimity among all present before making a decision. Point-by-point paralysis is one possible outcome, but to many occupiers that’s an acceptable hazard for a political experiment that’s focused almost as much on process as on protest. Definitely not, indeed. A report delivered at the end of the most recent assembly indicated that Occupy Burlington has about $1300 on deposit in a local credit union. The group owes the UU church $675 in rent for use of its meeting space. “Drawing in a new generation of activists” and “building connections across a broad spectrum” qualify, in Leavitt’s view, as two of Occupy Burlington’s chief achievements. About 25 people and two dogs were present at various points of last Sunday’s assembly on a chilly, cloudy afternoon in Battery Park. Another half dozen mainly older individuals might have attended, but there was last-minute confusion concerning the meeting’s location, with some who had gathered at the UU church deciding not to make the trek down Pearl Street. The average age of those present in Battery Park appeared to be mid-thirties, and a half-hour into the session, 17 men and five women were standing in the assembly’s circle formation. In their discussions of tactics and future actions, Occupiers are clearly worried about the potential for heavy-handed responses from politicians and police who are growing increasingly intolerant of militant protests. More than paranoia and melodrama are at play. Mention is often made of the new law, signed by Obama, that permits indefinite detention of any American the government suspects of involvement in “terrorism.” Proposals for criminalizing some forms of nonviolent dissent are currently being discussed in Congress. Most of those speaking at the March 25 assembly about the planned “Occubama” demonstration at the corner of Spear Street and Williston Road suggested there will probably be no problems with police. “I don’t expect a crackdown,” Hartley said. “This is a fundraising PR event for the president, and they don’t want it to look like a police state.” About 120 Facebook users have already expressed their intention to join the March 30 protest, which will focus on Obama’s economic and security policies as well as his recent approval of a portion of the potentially climate-altering Keystone Pipeline. 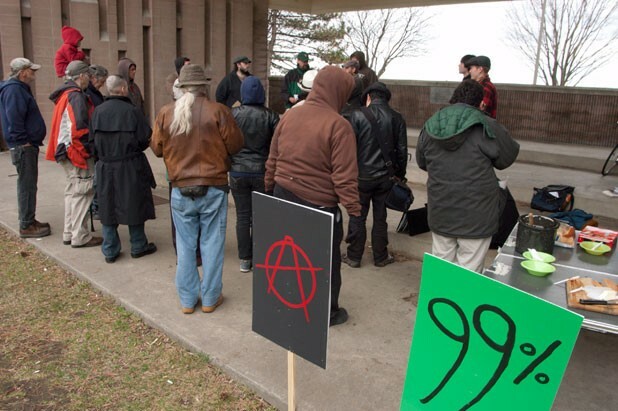 There’s no doubt that Occupy Burlington, like its counterparts in many other cities, continues to enjoy at least the sympathy, if not the full endorsement, of many who comprise the 99 percent. That was made manifest in a Town Meeting Day advisory referendum in which about 78 percent of Burlington voters supported the adoption of policies aimed at narrowing the disparity of wealth in the United States between the richest 1 percent and everybody else. Economic inequality is not some distant or general problem to be addressed by Vermonters solely as a matter of solidarity, Leavitt notes. “The material conditions in Vermont that gave rise to Occupy here haven’t changed,” he says. “The income of the top 1 percent of Vermonters has tripled since 1970.” Moreover, Leavitt adds, the University of New Hampshire’s Carsey Institute reported in 2007 that, over the previous 15 years, Vermont experienced the second-fastest rate of increase in income inequality among all 50 states. Connecticut ranked first. “Whether or not there’s an actual occupation, it’s incumbent on elected leaders to do something about this inequality and about Vermonters’ right to health care, education and affordable housing,” Leavitt says.